Bought this at the grocery store last week. Last week, before prices started to rise on flowering plants for Valentine’s Day, I picked up a pot of florist’s cyclamen to brighten up the kitchen–and to make sure I had a bloom for Garden Bloggers Bloom Day. (Here’s the owl’s summer home.) There are hardy cyclamen that can live outdoors in the northern reaches of Zone 5, but these big beauties aren’t it. Still, I have heard that they eventually go dormant and you can bring them out of dormancy to grow indoors the following year. Can anyone tell me more about this? This pretty thing was snuggled up against the window, hidden until I turned the pot around. A day or two after I bought the cyclamen, I caught a glimpse of white up against the kitchen window. 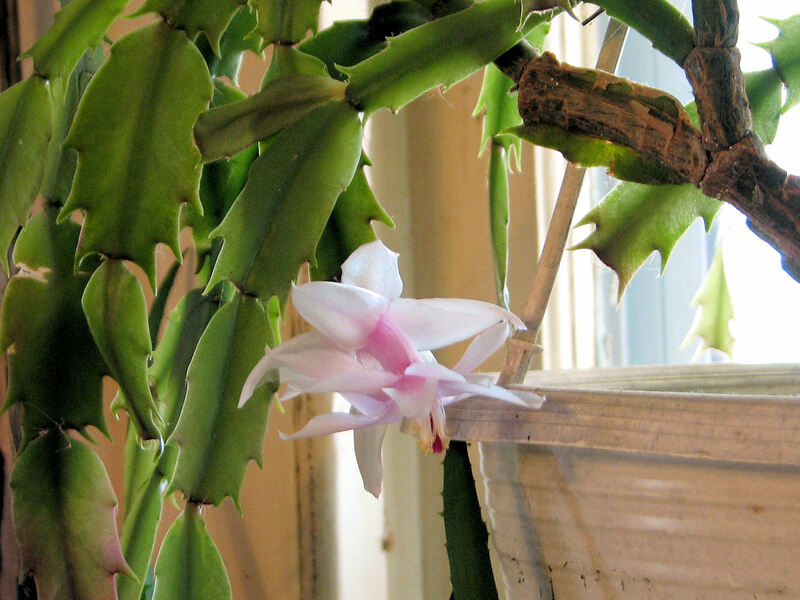 Turns out my other “cactus,” stimulated by the cooler temperatures next to the glass, had also started blooming. I had thought this was a Thanksgiving cactus, and expected it to bloom before my other one if it was going to bloom at all, so this was a complete surprise. Since the sun was shining, I thought it couldn’t hurt to check my snowdrop patch to see what was going on there. I am pretty sure my snowdrops are Galanthus nivalis. I want to get G. elwesii to start my snowdrop season off sooner. (Don explains the differences between the two common species.) I’m taking note of where the snow melts first and am planning to plant them there. 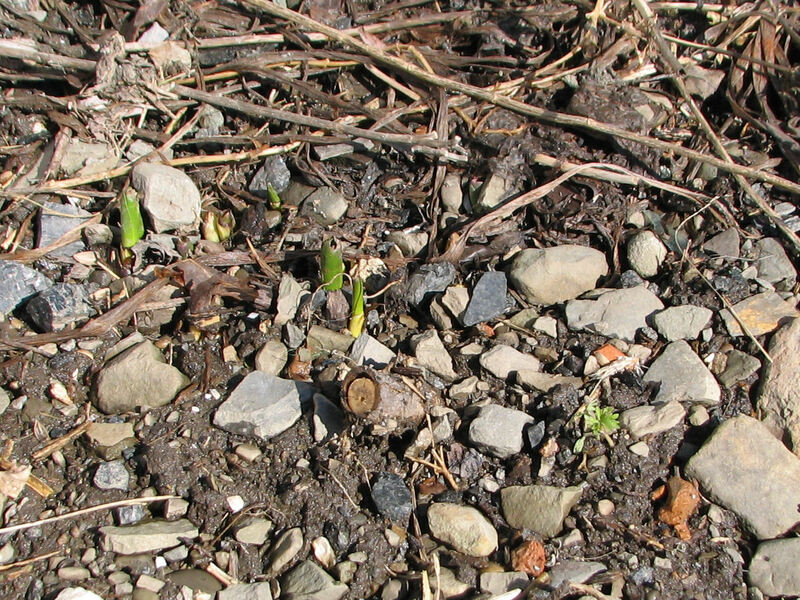 Colchicum foliage and one brave seedling--can you see it on the right? Many colchicums start sending their foliage tips up well before spring starts. The tips are subjected to quite cold temperatures and get browned and rather ratty-looking, but the leaves finish emerging when the temperatures moderate and always do fine. 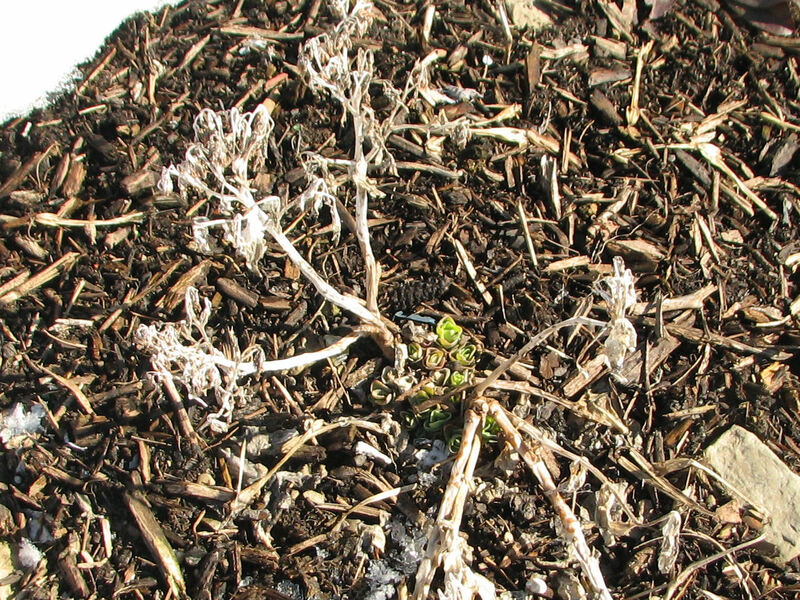 I think that one little seedling (click photo to enlarge) is a larkspur. 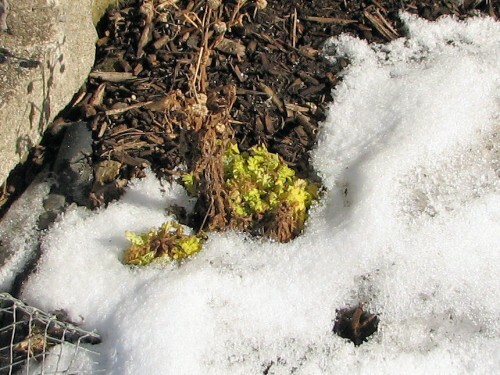 Sedum spectabilis 'Hot Stuff' is poised for spring. This sedum is a trial plant sent by Terra Nova nurseries last year. It looks like it will be back again this spring. The tag says it’s hardy to -15F (-25C) and we didn’t get quite that cold. It is supposed to be shorter than ‘Brilliant’ and not spread apart in midsummer. We shall see about that. I started these feverfews with seed from the American Horticultural Society’s seed exchange. Feverfew foliage tolerates the cold temperatures of early spring around here and looks nice long before the flowers start blooming. In another month I’ll be trimming the brown stuff away so it will look its best. 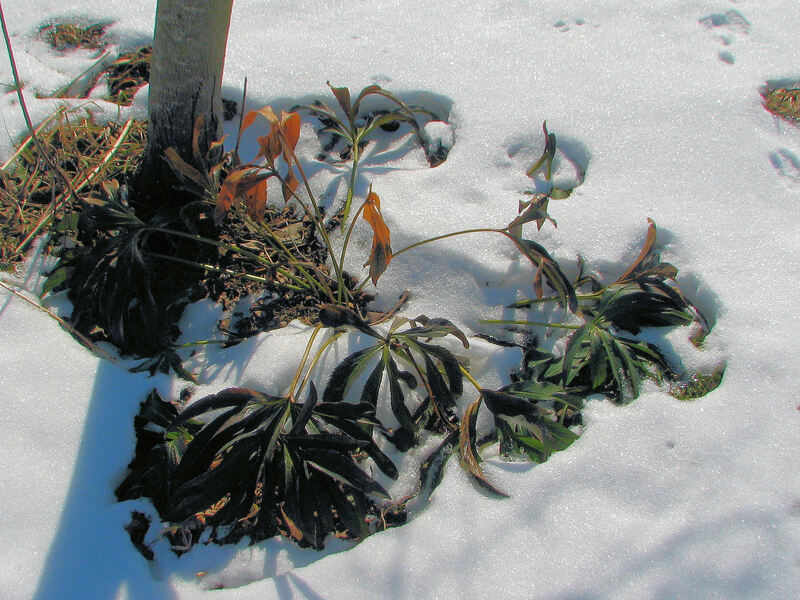 This is an unnamed seedling from Seneca Hill Perennials that appears to put out new foliage throughout the winter. It’s not the best photograph, but there is everything from browned foliage to freshly emerged green. It blooms for me in May. 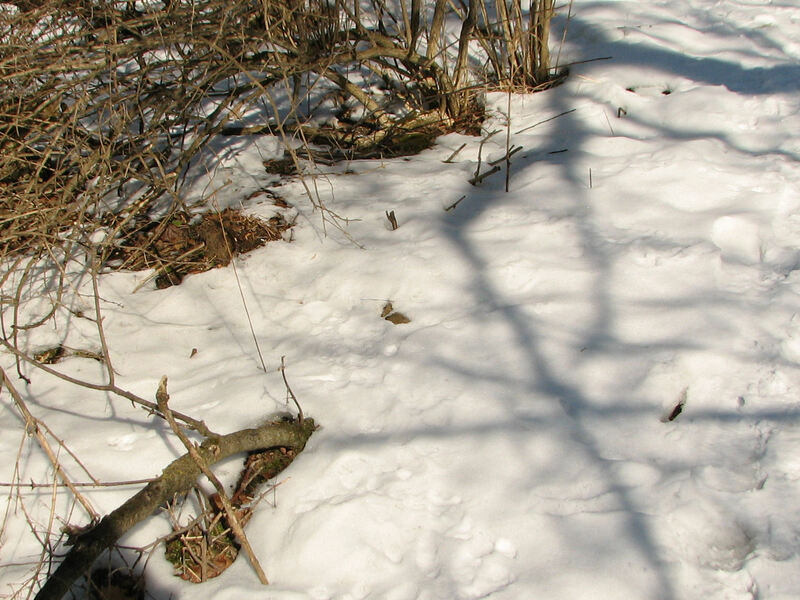 No, spring hasn’t arrived yet, but the promise of its arrival is there to see in every thaw. When do I start tomatoes from seed in upstate NY? I always get tempted to buy cyclamen when I see them in the shops. At first I found they didn’t thrive with me until I asked a friend how she keeps hers so well. While in doors keep them in a cool room and put then overnight in water when they start to dry out. This seems to revive them for the next week. At the end of their season once the frosts have finished, I put them in my garden still in their pots and forget about them. I have a sheltered shady area near the patio where they are protected behind a retaining wall. The summer plants tend to cover them during the hot times and come September I find I have buds on the plants and some will have started flowering. I then bring them indoors and keep them in a cool room and enjoy another season of colour. I have had some for about 5 years but eventually they do dwindle and look rather spindly. I also have a variety of small cyclamen in the garden again in a bed near the house so it is somewhat sheltered, but north facing. Each year I forget they are there and nearly accidentally dig them up, but they always surprise me in spring with their vibrant pink next to the snow drops and each year they seem to multiply. I have come to believe they thrive on neglect. Hi, Jennah–Mine is near a pretty cold window, and we keep our house at 68F, so even though it is in the kitchen it is on the cool side. I keep it moist, trim off the dead flowers, and just this week gave it a weak fertilizer solution, in the hopes I can encourage it to keep blooming. It doesn’t have as many flowers as when first got, but it is still making new blooms. 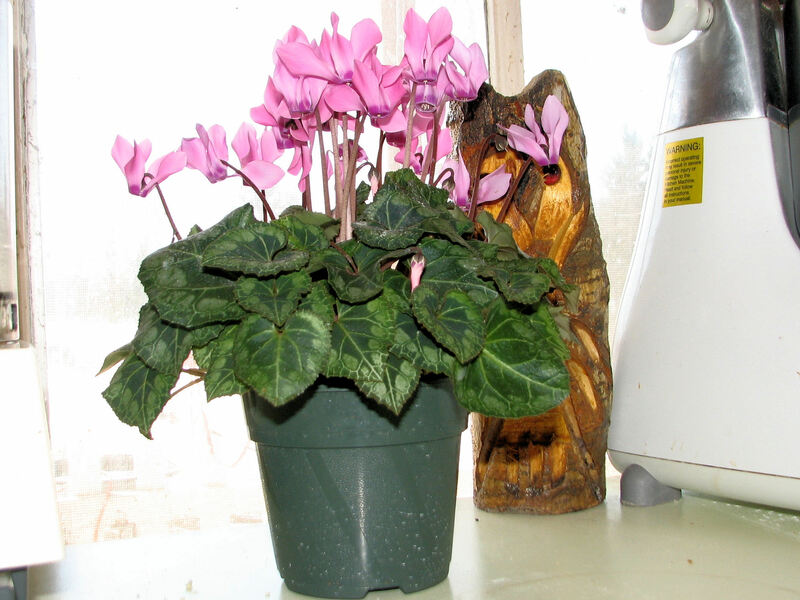 Ok so my cyclamen doesn’t look like that anymore (got it for Valentine’s Day). Have you had luck with yours? After hearing its optimal temp is 50 degrees, I’m unsure if it can make it in doors (generally 71 degrees in winter). Makes me sad bc they’re so pretty. What sort of surgery should I do to make it last? Is yours still pulling through? My mom has ordered some hellebores this year. Didn’t know they were (semi)evergreen. I’ll have to let her know! There is nothing better to cure a wicked case of self obsession that a good dose of fresh air and dirty work. She writes so beautifuly. I miss her web presence. Kathy, that does look like a larkspur seedling near the colchicums. What a brave little plant! I love that pale pink Christmas cactus, too. Kathy, I keep my cyclamen as a houseplant, with no special treatment. I overwinter too many outdoor plants to bother w/ fussing with dormancy for aq cyclamen. I will say it is potbound, in a rather cold room, in the window, where it has happily lived and bloomed its little head off for 9 years. It’s the same color as yours; I had less luck with a red one. Thanks for the info. I knew one of my online garden buddies had had good luck keeping one going. Everywhere I go, people are talking about hellebores, and I just discovered them last year at my sister’s new place. She’s not the generous gardener I am, and says she can’t dig any up for me, so I’m going to have to find some on my own. Sue, hellebores can be slow-growing, which could be why your sister didn’t want to share. For the same reason, they can be a bit pricey. I know they are available via mail order, if you can’t find any locally. And they vary quite a bit in bloom time. Mine aren’t the first thing blooming by a long shot. Can’t tell you much about the cyclamen, that’s one plant I haven’t tried to grow indoors, or outdoors. It’s pretty, though, and just the plant to have to take your mind off of all that snow out there! 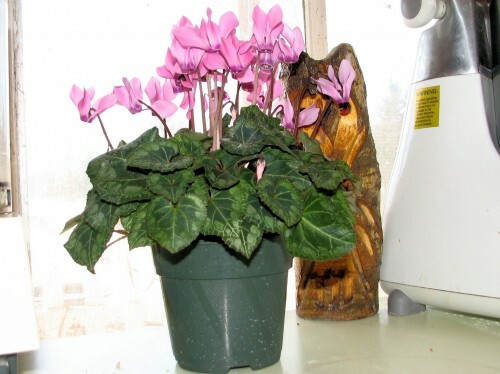 Kathy, I, too was able to “oversummer” a cyclamen, and it did bloom the following year. I kept it inside in the air conditioning during the summer and watered it very little. After that second blooming, however, it succumbed the following spring. Good luck with yours. I have done a post on how to try and ‘coax’ the Cyclamen persicum to rebloom, but ‘coax’ is the operative word. Follow my website to see if you have the magical green thumbs it requires. I coaxed one two years ago but lost it this past fall. Of course it doesn’t stop me from buying them whenever I see them offered! I’m so glad your Colchicums have sprouted too. I thought mine we’re being weird because they are in the microclimate against the house by the chimney. If you ever find out how to revive those florist’s Cyclamen, let me know. I’ve resisted buying them, but I’m willing to give them a try next winter. Not all colchicum seem to do it. The byzantinums are notorious for it, & I suspect the others that do it have byzantinum in their lineage. The one pictured is ‘Autumn Herald.’ As for the cyclamen, see eliz’s comment. At least you’re showing signs of life, Kathy. 🙂 It’s pretty barren here in NS, but it won’t be long now. Your Cyclamen is very pretty, and bonus on the Christmas Cactus — very pretty! Kathy, there’s earth showing here too, and bright sunshine, but it’s still very cold outside. My snowdrops will be a while yet. My last winter’s cyclamen did beautifully up until a month ago. Now I’m wondering if it’s dead or dormant. I hope it’s the latter. Sorry I can’t answer your question. Your new one is lovely, and so is the Christmas Cactus. Mine developed a few more buds but they shriveled or dropped off, unfortunately. I do have a little patch of bare soil surrounded by acres of snow, but ther will be no snowdrops for months yet. Still I did have a bit of indoor bloom including the ever dependable abutilon.